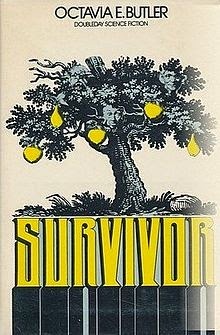 After reading Gerry Canavan's essay on two newly published short stories by Octavia Butler, one of which is a prequel to her 1978 novel Survivor, I decided it was time for me to read Survivor, since though I'd read most of Butler's books, and repeatedly assigned a couple of them in classes, I'd never gotten around to this one. The problem, however, is that Survivor is a book Butler disavowed and, once she had the ability, she prohibited it from being reprinted. Used copies tend to sell for at least $65 (although one just sold on E-Bay for $15. Alas, I discovered it only after the sale! ).